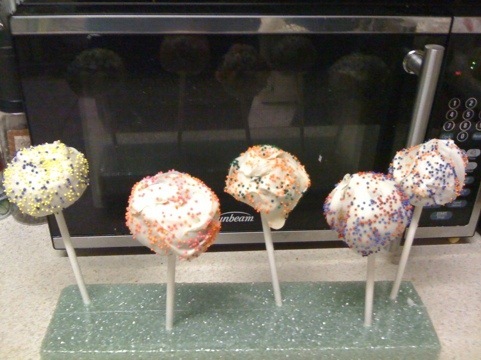 The newest craze in the cake world is cake cops – basically cake on a stick. I found a tweet last week about these delicious little bites and was instantly intrigued. So I looked further into how to make these and discovered that it’s actually pretty easy, if you do it right. 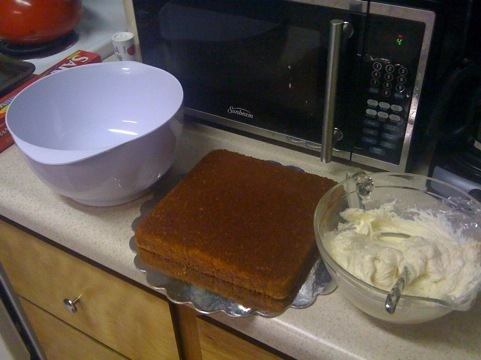 Since it’s still November, and it’s my favorite, I decided to make more pumpkin spice cake along with cream cheese frosting, of course. The first step is to bake the cake as normal. 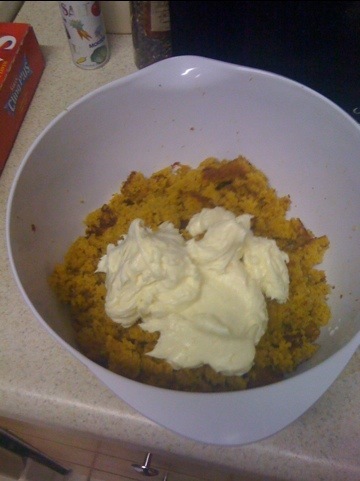 Once the cake has cooled, crumble into a big bowl. Next, stir in half of the frosting and mix with had until thick. 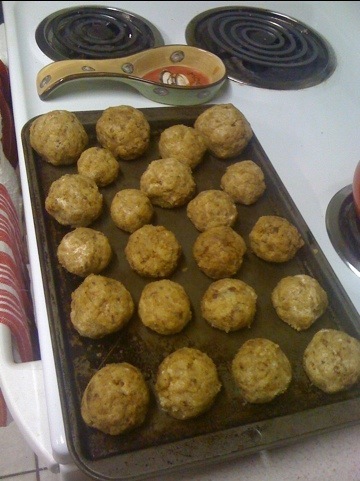 Next, start rolling mixture into 1″ balls and place on a cookie sheet. Cover sheet with plastic wrap and refrigerate for an hour or overnight. Do not freeze because the candy coating might crack. Melt colored candy chips or chocolate using microwave directions. 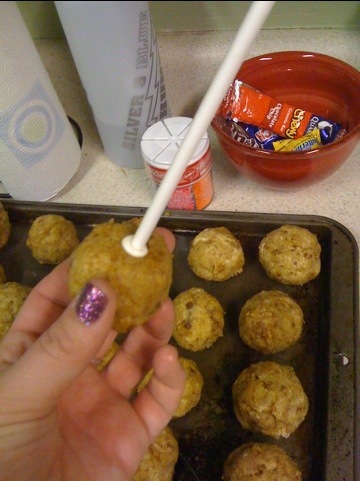 Dip the tip of the lollipop stick in a little of the melted candy and insert into the flat side of the cake balls, so that the top is still round. Insert sticks about halfway. 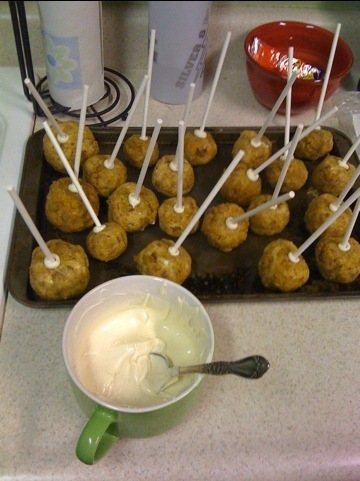 Carefully insert the cake ball into the candy coating by holding the stick and rotating until covered. Once covered, remove and softly tap off excess candy. 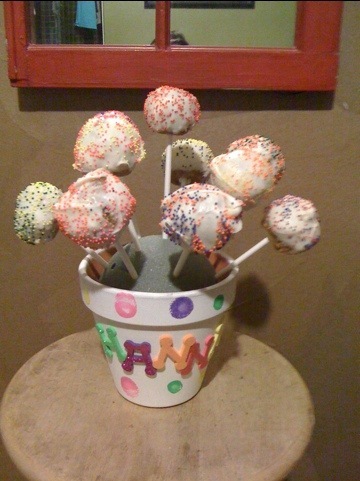 Immediately cover with sprinkles before the candy sets, and insert into a styrofoam block to harden.